Paper Prototyping was conducted with blind and low vision participants from the Perkins School for the Blind in Watertown, MA. Founded in 1829, Perkins was the first school for the blind in the United States. Today, Perkins serves approximately 200 students on campus each year and works with organizations in 67 countries to improve the lives of the 4.5 million children around the world without access to education due to blindness. The institution is internationally renowned for its work on behalf of the blind and deafblind, thus making it an ideal institution to serve as advisors and end-user testers. Throughout the grant period, Perkins administration, staff, and students have been incredibly supportive of our efforts. Their contributions have been vital to the project. 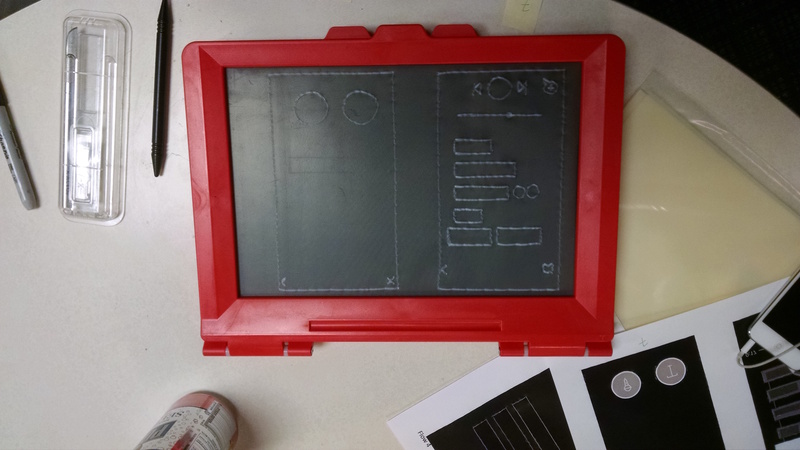 The Access App evaluation team chose paper prototyping with raised-line drawings as the primary method for testing because it yielded thoughtful comments in a rapid timeframe without having to build something physical for this interim testing. The PEM evaluation team conducted one tactile paper prototyping session with a group of three staff from Perkins, focusing on user interface design and user perception using the most recent (V5) project wireframes. Wireframes are a set of images that display the functional elements of a mobile application. They are typically used for planning a mobile app’s structure and functionality. The PEM team translated printouts of the project’s V5 wireframes into raised line drawings by hand. 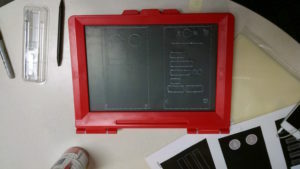 The team used an inTact Sketchpad to simplify designs down to their basic functional elements so that blind and low vision users could feel these designs as tactile maps. For more information on the method of tactile paper prototyping, please reference Appendix F: Miao, Mei, Wiebke Köhlmann, Maria Schiewe, and Gerhard Weber. “Tactile paper prototyping with blind subjects.” Haptic and audio interaction Design (2009): 81-90. Prior to the evaluation session, the facilitators briefly described the project and explained how they would reenact the dynamism inherent in the app and act as a screen reader for all written content absent from the raised line drawings. Please see Appendix E: Paper Prototyping Materials Toolkit for Blind/Low Vision Testers for a detailed walkthrough of the screens/flows. Participants were initially confused about the raised line buttons and asked, “Are these outlines for buttons or just lines?” They also queried, “Where is the physical indication of text placement in relation to overall design?” Participants seemed to quickly adapt to sensing the drawings in relation to the screen descriptions as time went on. General note: the simplicity of these screens is a great except for screen 6, which is too busy. Where is this content stored? How does the museum know there’s been newly contributed content to vet/approve? Does the content automatically get fed in? How can the museum maintain a bit of control? I like that they’re horizontal buttons that fit the screen because they’re easier to not miss, especially if you’re swiping. Wouldn’t this be done before you’re in the app? Wouldn’t it automatically be done with download so information on screen 1 is customized? Is there a reason not to enable location? All testers agreed: Provide a tutorial integrated into the beginning experience that will let people know all their options right off the bat versus the current staggered orientation that feels more like a hurdle. Be careful with overlays; they can be tricky with a voiceover, and for users with cognitive disabilities and low vision, text over text is very confusing. If you activate button B, it should open a separate screen (with a back button) that allows me to play that specific content; otherwise there’s a lot going on in any given space. Don’t have buttons present when they’re not needed—e.g., only have the scrub bar when audio content is playing. If I selected round “T” button, I would expect something to be read to me. We like the sequencing of gallery overview first (big picture context is nice), then objects/subthemes. Audio Description (AD) content – Advocate for ability to filter out content if you’re sighted, or aren’t interested in hearing this content; people should have the option of turning it off. You really should give the user the option to choose what kind of content they want to hear. How can I jump directly into crowd-sourced content versus user comments? I don’t think a user would want to wade through all the AD and museum contributed content just to get to other users’ perspectives. Crowd-sourced content: if someone contributes, where does it go and how does it fit into all the other content? What’s the difference between the “X” button and the “<” button? Why don’t you just have one option to exit? What thoughts does this provoke in you? What runs through your head when you see this? I would just take people back to the core experience after contribution.